When Paul said Christ is "our wisdom from God" (1 Cor. 1:30), he was expressing what is known as "Wisdom Christology," an area of biblical teaching much neglected in modern times. 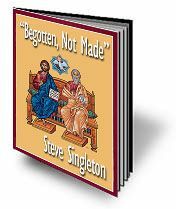 This e-book traces the understanding of Christ as God's wisdom, especially as it relates to Prov. 8:22, which speaks of the birth of wisdom at creation. Does this imply that Christ is a created being? The answer is no, and this e-book explains why. When Paul said Christ is "our wisdom from God" (1 Cor. 1:30), he was expressing what is known as "Wisdom Christology," an area of biblical teaching much neglected in modern times. This e-book traces the understanding of Christ as God's wisdom, especially as it relates to Prov. 8:22, which speaks of the birth of wisdom at creation. Does this imply that Christ is a created being? The answer is no, and this e-book explains why. It explores the various ways in which the early church fathers understood the relationship between God the Father and God the Son and offers a brief exegesis of Prov. 8:22 in its original context and its New Testament application to Christology.